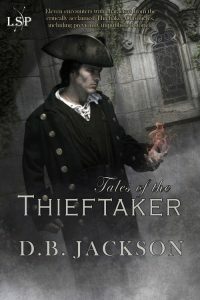 Today is release day for TALES OF THE THIEFTAKER, the new Thieftaker short fiction collection that I am releasing as D.B. Jackson. This project has been a long time in the making, and I am extremely excited to see it in print. For fans of the Thieftaker Chronicles series, this collection includes a special treat, “The Ruby Blade,” a full-length novella, which is the centerpiece of the compilation. This story, at long last, relates the details of Ethan Kaille’s involvement in the Ruby Blade mutiny, which led to his court martial and his years as a prisoner/laborer on the sugar plantation in Barbados. But this is more than just a prequel. “The Ruby Blade” takes those past events and braids them together with a new adventure that begins with a visit from none other than Sephira Pryce, Ethan’s nemesis and rival in thieftaking. So we have two stories in one, and it is, I believe, the best piece of short fiction I’ve written. For those of you who are unfamiliar with the Thieftaker books, this collection is a great entry to the universe, as well as a wonderful introduction to Ethan Kaille–my thieftaking, conjuring hero–and so many of the characters who inhabit his world. The Thieftaker novels and stories are set in pre-Revolutionary Boston, and they combine historical fiction with mystery and fantasy. Give them a try! Whether you are new to the Thieftaker world or a returning fan eager for more stories about Ethan and his friends, I hope you will enjoy TALES OF THE THIEFTAKER (from Lore Seekers Press). Once again, the cover art was done by the wonderful Chris McGrath, whose work has graced the covers of all the Thieftaker novels, as well as the two stories originally published at Tor.com. You can order the ebook from Amazon or Barnes and Noble. Or you can order a paperback edition, also from Amazon or B&N.